In the current era of globalization, when the way of life is being firmly governed by large conglomerates, supermarkets has taken over our daily necessities, creating needs and then satisfying them with products flying, sailing and jettisoning in from around the world. According to an UNESCO report such unprecedented acceleration and intensification of globalization may have a homogenizing influence on local culture, create new opportunities for millions but such integration may well result in loss of uniqueness of local culture, which in turn can lead to loss of identity, exclusion and even conflict. According to another report, in the UK, 97% of food items are sold by supermarkets and hypermarkets, with fewer than 1,000 specialist fishmongers, 7,000 butchers and 4,000 greengrocers, and barely 3,000 independent bakeries still left, but may well close down in the near future. France does barely better in the survival rate of local vendors with supermarkets taking over more than 75% of our daily needs and the 6 principle groups (Carrefour, Leclerc, Auchan, Casino, Intermarché and Système U) commanding 85% of that market. Politics has also played its part in the group of supermarkets and hypermarkets with a 2008 ruling that made it easier for large groceries to negotiate with the suppliers, though in turn making products at least 10% cheaper to the customers but all at the cost of the base producers and their meager profits. However local markets have still survived largely throughout France, mainly due to the persistence of the local producers and the inclination of the habitants for local seasonal fresh products even at slightly (must mention not always though) higher prices. Most food items reaching the houses of Paris arrive at the wholesale market of Rungis, in the southern suburb of the city, from where they are distributed to restaurants and more than seventy local markets that can be found scattered around Paris. At such local markets one can find the real appetite of Paris and a quintessential culture that has survived over centuries in the heart of the Parisians. I will over time describe some of the best and well-known local markets of Paris and I will start with the oldest market of Paris that just celebrated its 400 years of existence. 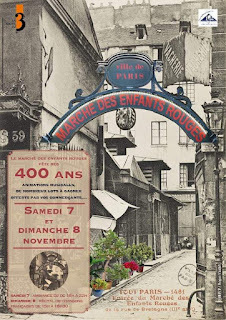 The Marché des Enfants Rouges is located in the famed quarter of Marais in the 3rd arrondissement of Paris. Let us start with a bit of history. In early 17th century, Henry IV wished to extend Paris beyond its northern limit and a new square was constructed with roads radiating out towards the different provinces of France, namely Rue (street in French) de Bretagne, Poitou, Saintonge, Perche, Picardie and Berry. In 1615, two commissioners under Louis XIII opened a small covered market at the corner of Rue de Bretagne and Rue de Berry which was named the Petit Marché du Marais after the newly constructed quarter of Marais. This market in the late 18th century came to be known as the Marché des Enfants Rouge (in English the Market of the Red Children) due to the presence of a nearby orphanage for lost children who were dressed in red. The same market exists today, making it the oldest surviving market of Paris and was added to the list of historic monuments of France in 1982 and was completely renovated in the 1990s to give the market its modern charm. The week-end of 7-8 November 2015, the oldest market of Paris celebrated its 400 years of existence and we participated in the aura and festivity that were held to commemorate the occasion. Apart from the usual merchandise that are generally available at the market, the celebration also included musical programs, miscellaneous animations and performing artists and some memorable nostalgic French songs by singer PattiKa. On other days the market is also well known for its conviviality where the vendors and habitants share a jovial relation and the merchandise are available throughout the year. The habitual merchandise includes local products like fresh fruits and vegetables, organic products (and this constitutes about half of the merchandise), oyster growers, wine merchants and specialist caterers that serve cooked local delicacies. Common French products such as ham and cheese from all regions of France are available here and each province of France has its dedicated stalls in the market, somewhat fulfilling the initial project of Henri IV which I mentioned above. Other special stalls include Moroccan, Asian and Mediterranean products and florists that fill the market with the fragrance of fresh flowers. Restaurants, cafes and even an antique stall selling historic photographs of Paris displaying its bygone era can be found at the market. The Marche des Enfant Rouge is surely one market that is worth a visit when in Paris. However one should be careful to avoid the busy hours which is generally from noon to about 13.30, if one is looking for tranquility to enjoy the pleasures and nostalgia the market has to offer.